I think the overall problem with this half-season of Doctor Who has been how every story thus far has been a high-stakes mega-tale. "The Bells of Saint John" had the whole heapin' world threatened by Wi-Fi and last week's "Cold War" set Earth poised on the brink of nuclear annihilation. Only "The Rings of Akhaten" really worked: mostly by being set on a distant alien planet and assaulting us with senses-overdriven spectacle the likes of which we haven't seen since Jack Kirby was around. But "Hide" - this week's new episode of Doctor Who - brings the series back to the fine form its fans expect, nay, demand. 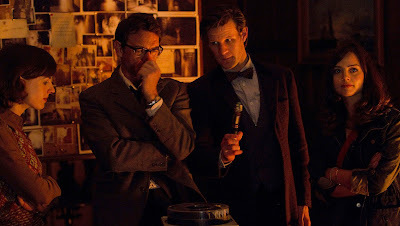 And it does it with a genre that Doctor Who has excelled at over the years: gripping horror... with a twist. It was a dark and stormy night when The Doctor and Clara arrive at the doors of Caliburn House, somewhere on the misty moors of Britain circa late autumn 1974. Psychical researcher Professor Alec Palmer and his empathic assistant Emma Grayling are investigating the spectral "Woman of the Well". A phantasm known and feared since the time of the Saxons (the Celtic tribe, no relation to... you know), the ghost was known to terrorize American soldiers stationed at the house during World War II. But it's not a confrontation with so mundane an enigma as a phantom which has drawn The Doctor to visit Palmer and Grayling. Rather it is his pursuit of "the only mystery worth solving". I'm not going to divulge much more about "Hide", because this really is the kind of story that a person deserves to go into pretty cold. Suffice it to say I was far, far more entertained by this episode than anything we've previously seen since "The Snowmen" special on Christmas Day. "Hide" is a much more intimate and personal story, set amid the harrowing halls of a truly haunted house. It reminded me greatly of "Horror of Fang Rock" from the Tom Baker era, with a touch of "The Empty Child"/"The Doctor Dances" (one of the most beloved of the revived series). In addition to how the story resolves, I thought the most delightful part of "Hide" was how Palmer and Grayling are intricate analogies of The Doctor and Clara. And through them we gain a considerable insight into the relationship between the last Time Lord and his newest companion. But as a longtime Doctor Who fan, I can not write a review of "Hide" without making note of the references to stories from the classic series. To be fair the revived show has had them before but ever since "The Snowmen" they have been coming faster and harder. Well, "Hide" hits us with the biggest barrage of them yet! For the first time since the 1996 television movie we get a mention of the Eye of Harmony. The cloister bell sounds. The Doctor uses a Metebelis Crystal (last seen in Jon Pertwee's final story, "Planet of the Spiders"). The TARDIS is missing a certain item of furniture which was well-used by the Seventh Doctor. And then there is what can only be a shout-out to "The Celestial Toymaker" and the E-Space Trilogy. Matt Smith and Jenna-Louise Coleman are growing their chemistry as The Doctor and Clara. But the real catalyst at work in "Hide" is Dougray Scott and Jessica Raine as Professor Palmer and Emma Grayling. I found their relationship with each other as enjoyable to watch as the one between The Doctor and Clara. Maybe more so, even. "Hide" is a little capsule of everything that a good Doctor Who story should be. It's a limited cast of characters and only two or three real set pieces, but it pulls off an amazing tale rife with fear, laughs, and in the end, love and triumph. I'll give "Hide" Four Sonic Screwdrivers out of five. This was Neil Cross's second outing as a scribe on Doctor Who (the first being "The Rings of Akhaten") and already he's getting substantially better. That episode was a visual feast and had some epic speech... but "Hide" is a tale which it's far easier to relate to. And it's an awful lot of fun! Transmitting next week on BBC and broadcasting on BBC America (gotta love those nuances between British and American terminology): "The Heart of the TARDIS".